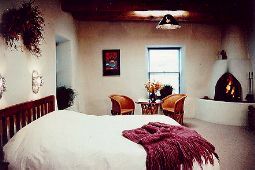 THE GALISTEO INN is situated on 8 serene acres in the historic village of Galisteo, just half an hour southeast of Santa Fe. Close to diverse seasonal splendors and the multi-cultural events of northern New Mexico, yet off the beaten path, The Inn provides the ideal environment for a memorable getaway. The 250-year-old hacienda bed and breakfast and grounds were the estate of one of the region's original settlers. In less than an hour, you can stroll the magical village of Galisteo, founded as a Spanish colonial outpost in 1614. Now the home to writers, artists, entrepreneurs and healers, the community still retains a strong sense of its Native American heritage and Spanish Traditions. Inside, The Inn is a place for sheer comfort and enjoyment. 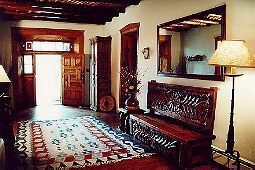 Corner fireplaces, plank and Mexican tile floors, and thoughtfully decorated rooms add charm to its adobe heritage. The Inn offers horseback riding, massage, a 50 foot lap pool, spa, sauna and mountain bikes in addition to creative regional dinners. (Dinners and riding are also available to the public). This and other Galisteo Bed and Breakfast Inns can be found here in The Register.